After posting my weekly numbers on Sunday, I wrote a 1,075 word article for Columbus Beer Scene about the Dayton AleFeast event. On Monday, I continued with 750words.com and got 776 words in. During my lunch hour, I spent time reading Tim Ferriss' blog (source of some quotes below). I spent the rest of the time trying to work out the ASL story using Snowflake Pro. I find that I'm really starting to understand story development in a way that has eluded me until now. While writing descriptions of what I thought would be the last couple of scenes in the story, I realized that I'd made some huge mistakes in the earlier parts. Given the way the aliens in this story behave, it's non-sequitur that the supposedly derelict craft the crew encounters wouldn't have tried to repel their ship and shuttle as they tried to board. This needs to be fixed. I also wrote a 460 word post for Columbus Beer Scene about Temperance Row Brewing in Westerville. I also wrote a post about Buckeye Brewcraft, a homebrew shop in Westerville, which generated 464 words for Begin Brewing. On Tuesday, I moved the journaling from 750words.com to Penzu, primarily because I'm not sure I'll stick with it. 750words is $5/month after the first 30 days, while Penzu is free unless you pop for the Pro features, which I may do if I decide they're of value. I got 781 words there. On my lunch hour, I worked on the Captain Garrick post for How to Write Fiction. It's at 1,546 words now. Didn't do any writing of significance on Wednesday. Work was very demanding and I simply didn't have the energy. Thursday I came home and wrote a journal entry to cover Wednesday and Thursday. Got 1,262 words in there. Added the Death Wish Coffee quote. 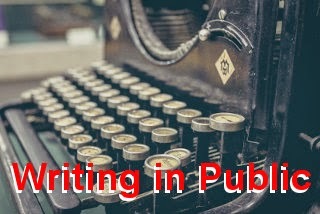 Wrote a post for the Application Repackaging Blog (534 words). Friday I didn't do any writing. I was tired from having been awakened during the night to resolve problems for my job. Saturday I was up and moving early. I wrote a post about Zaftig Brewing Company's First Anniversary celebration on Feb. 28 for Columbus Beer Scene (61 words). I finished the characterization series on How to Write Fiction with a (2,008 word) post showing another scene in Captain Garrick's life. I used the two scenes I'd written, with some intro text, as posts for the ASL site (for 1,881 and 1,860 word posts). I did a post about The Grainfather for my Begin Brewing blog (701 words). I also wrote one on Yeast Starters (1,357 words). Sunday, I worked on a few blog posts. From the look of it, this was my most productive week since beginning this challenge. I managed about 60% of the words I did in my best month during this week alone. At work, I correctly diagnosed the cause of a problem as the way a software vendor created a "permanently registered" copy of their software. A number of successful people say that success doesn't come from doing lots of things, but from looking at what's on your to-do list, asking yourself which items provide the greatest satisfaction and impact, and blocking off time to do those. Much of what's on our to-do list is far less important than the energy we give it (e.g., email). Being nice to people isn't always the best policy. Sometimes it can drop a lot of extra work or pain on you. "This morning I added a shot of espresso to my Death Wish Coffee and about half way down the highway, I realized I left my car at home." Advertising email. The artists behind Big Hero 6 from Disney. They did a great job of creating what feels like an organic, real world in San Fransokyo. You know you're watching animation, of course, but it feels real anyway. John Flansburgh and John Linnell of They Might Be Giants - I love their music and they seem like they'd be fun guys to know. The alien AI character sketch I wanted to do for the ASL story. Below is how all the above activity turned into word count.